Lately, we’ve noticed a fair amount of interest among the RapidPro community in moving from TextIt to a self-hosted RapidPro installation. We understand RapidPro is an in-demand open-source software platform, and we’re flattered. We built it. That being said, there are a few factors worth considering before branching out. 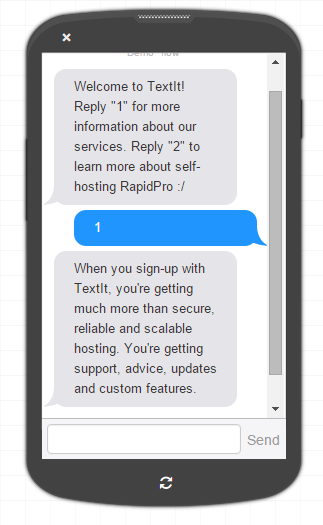 What is RapidPro and how does it relate to TextIt? We developed RapidPro, the platform that powers TextIt, and open-sourced it in 2013 to allow UNICEF to adopt it into their programming. The results have been phenomenal, as millions of people around the world use the platform to communicate issues and coordinate aid. Because RapidPro is open-source, anyone can contribute to it. In order to use it, however, you’ll need to either host it on a proprietary server or sign-up with TextIt. We host RapidPro for UNICEF and others in addition to the original service, TextIt. What services does TextIt provide? We spend a lot of money on a lot of servers to make sure you’re getting the best possible performance at the lowest possible price. Because there are multiple machines serving TextIt, the load is distributed to ensure maximum speed. What’s more, your data is almost certainly more secure with us managing it than it would be otherwise. This allows you and thousands of other unique organizations - from UNICEF to your local clinic - to focus on building custom mobile-based communication programs and deploy them anywhere in the world with ease. TextIt grew out of our experience as a consultancy. We’re always connecting the dots between use cases and useful features, but we care most about our users and ultimately build the features you request. In fact, our most recent feature updates were inspired by one of our largest and most innovative clients. These updates benefit every one of our users. Consider this: when you leave us, you’re removing our ability to modify the platform to suit your needs. We update the RapidPro platform daily, and we do so thoughtfully. We follow a strict procedure to ensure that none of the updates we push will negatively impact your flows. This process includes running old flows in all possible permutations to make sure they act in the same way. As time passes, the platform has fewer bugs rather than more. This is because we continue to add more test cases to cover new scenarios. We have over 95% code coverage in automated unit tests, and any bugs that are introduced are discovered by our vast user base and fixed immediately. These changes are automatically merged into all of the RapidPro instances we host. If you were to host RapidPro yourself, you’d have to merge these updates manually, as self-hosted RapidPro instances are snapshots in RapidPro’s ever-evolving life cycle. If you have the funds and expertise to self-host RapidPro, and can even manage to get it running smoothly, you’re still at a significant disadvantage in that you won’t automatically receive updated features. Our team works around the clock to answer tickets, resolve issues, and patch bugs. We’re constantly monitoring our servers and the platform itself, and responding to support requests from three different time zones, often more. When you host with us, you’re getting high performance with zero down time. We provide high availability and handle accounts with millions of contacts, and we didn’t get there overnight. Scaling requires significant expertise and investment. Bottom line: You’ll never outgrow TextIt. We’ve spent years building strong relationships and setting up connections with mobile network operators (MNOs) around the world, putting us in the ideal position to facilitate your connections to MNOs when aggregators aren’t present. If an aggregator doesn’t exist in the country you’d like to deploy, we can help you create connections for a small fee. As the firm that hosts both RapidPro and TextIt, we’re engaged with the widest variety of organizations around the world using messaging for their programs. Through these partnerships, we’ve learned about RapidPro’s many use cases, specifically what works and what doesn’t. This puts us in a unique position to help advance the community as a whole. When you ask a question, you’re guaranteed an educated, time-tested response. We invite you to reach out and take advantage of our Flow Coaching program. We don’t charge until it’s absolutely necessary. In fact, we give you 1,000 credits to get started. It’s free to sign-up and gain access to all the features you’ll need to build and test your flows. What’s more, we don’t tier our support. Free accounts get just as much love as our largest paid accounts. Once you’re ready to send and receive messages or phone calls, you can purchase credits as you need them. Each credit is equal to one message sent or received, and costs about a penny. If you’re a small nonprofit organization with limited funding, let us know. If you justify the need, we’ll have the conversation. We understand the allure of open-source software. It’s free and malleable. What isn’t immediately apparent, however, is the array of hidden costs. Let us continue to accept this burden for you, and together we can advance this outstanding platform.